The Netherlands, Eindhoven area, Matt L.
USA, Connecticut, Hartford to Boston, Peter K.
Some of you folks have entered my sphere of consciousness. In other virtual networks, I have met some contacts, 99.9% of the time with a lot of pleasure (only one outlier). I even go on vacations, or occasionally have lunch with a half-a-dozen of them. Long-lasting virtual contacts sometimes abolish IRL social barriers. I dwell in the suburbs of Paris, France, and I won't be against meeting, sharing a glass or a coffee with any SE.DSP contributor, either in transit or sedentary. Would some of you feel interested in meeting some of your SE.DSPeers, when they are close by? Each from his/her location? [EDIT] If your answer is positive, I propose to open the answer by a mention of the approximative location (plus a radius of action). I've met with two on-line friends from music-dsp circles. It was great both times, had pizza with the first one (I bicycled to Sweden where we met) and beer with the second one (Norwegian, he had business in Oulu where I lived at the time). 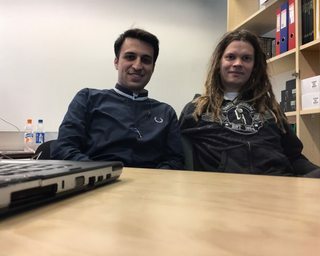 Users MimSaad (left) and Olli Niemitalo (right) in Oulu, 5 September 2017. I also think it could be fun meeting some SE.DSPers IRL if our space-time paths can be made to intersect with little effort. I can usually be found in the Eindhoven area, the Netherlands. Welcome to West Hartford, Connecticut, USA. Laurent, I'm a dinosaur from the comp.dsp usenet news days (though comp.dsp is still going, I find!). I made several online friends through there, and they've propagated to here, Facebook, and Twitter. It's always been a pleasure; I can't recall any outliers, though I dare say there could be some. Yes, I do feel relatively safe about such meetings. SE.DSPeers (the double "e" is on purpose) of all countries unite. I have a network of signal/image processing folks here. And know of a few nice bars and restaurants, with diverse types of foods and drinks. Welcome to Boston, Massachusetts and the North Shore! Yes love the idea and welcome any fellow "SE.DSPeers" (with the double E as Laurent notated) for a beer, coffee, etc when in the Boston Massachusetts USA area, when space-time paths can easily intersect as MattL described. Hello from the United Kingdom (South Wales). Finland, France & The Netherlands are pretty close too. I wonder if a meetup could be triggered in the greater area of an event we might all be attending (?) (e.g. a conference).